VisionApp is a German company where a well known SBC specialist Bernard Trisch works. Out of practices in the field they developed VisionApp Platform Management Suite (vPMS). 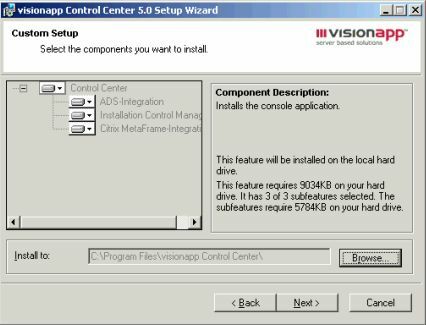 The VisionApp PMS software is developed to deploy servers (mostly related to SBC) from the beginning with installing Windows to the installation and configuration of applications. VisionApp PMS uses several third-party software to do a specific task in the overall process. Using templates, variables, preconfigured settings and prepackaged applications should help you to install your server quick and simple with the same settings. As mentioned before VisionApp is using third party software to support vPMS. The first step in the installation process is installing Microsoft ADS together with VisionApp additional components (vADS). You should download ADS yourself and place the setup files on the server. You can install ADS automatically using the setup of VisionApp. In this way ADS is using a MSDE database, if you would to use a SQL server database you should install ADS manual and add the vADS components afterwards. After installing the ADS component you are following the same steps if you were installing ADS only. A server must be configured which would be used as a template server for the ADS image. Then the image is made using standard ADS. When the image is completely available the VisionApp Control Centre (vCC) can be installed. It is possible to install more vCC's in your environment. When installing the first vCC the SQL database need to be created. In this database all settings of vPMS will be saved. When the installation of the vCC is finished the products are in place to configure the vPMS to deploy servers and applications. The vADS component need to be installed once, because of that it is logical that this part is not setup unattended. The Control Center can be installed unattended via parameters specified in the manual. Although the installations looks quite simple, it is not that easy. You definitely need the manual to install all the products in the right place. Because vPMS exist of several components and needs third party products like ADS, MSDE and/or SQL you need to have an amount of hardware to store the product. After installation the components the real works actually just starts. Now you need define your (new) environment in the vCC and configuring the settings for deployment. When you take a first look to the vCC there are two tabs. Resource Store and Infrastructure Management. - Automated Deployment Services → Here you can add your ADS images of the Operating Systems. Within ADS there is not much to configure, you need to specify your ADS server and user information to connect, so vPMS knows the images available on ADS for deployment. Installation Control Manager needs some more attention. First you need to specify a Distribution Point Set (DPS), this is a location where you store your application packages. It is possible to add more then one distribution points, but vPMS does not synchronize these DPS itself. After specifying your DPS you setup Installation scripts. VisionApp delivers together with vPMS a set of preconfigured application packages for common used programs. VisionApp delivers these application packages in a Wise format. Due to software policies of the manufacturer Wise can include the original source, so VisionApp has removed this part of the package. Therefore you need to reconstruct the packages. VisionApp has developed a special tool for this reconstruction process. This tool needs the Wise Installation System 9 program and the original software to be available on the machine where you reconstruct the package. After reconstruction you have an Wise installation package which can be deployed. VisionApp made the decision to add every package in Wise format, although the software has his own unattended installation script. The deployment mechanism can execute executables, CMD scripting and MSI files. A Installation Script Set is a combination of installation script. In this way it is easy to combine all applications for example the Desktop servers or a Silo server. After adding all your installation scripts and combining these scripts into Installation Script set, your environment is ready to deploy these packages. But first you add your servers to the Infrastructure Management. Within Infrastructure Management you can organize your servers in logical groups. Within this logical groups you can set up Farms. A farm is a collection of server with the same role (looking from a SBC perspective). At the moment VisionApp has defined the following Farms; Metaframe Farm, Standard Server Farm, Terminal Server Farm and Web Server Farm. Each farm has his own properties to configure. If choosing a Metaframe Frame you can configure all Metaframe installation parameters within the Metaframe tab. vPMS shows you with an exclamation mark which settings you must choose to reflect your environment. Because you can add as many Metaframe farms as necessary with each farm with his own settings. Also the Silo concept can be setup easily using vPMS. In this view you can see again that vPMS is developed from a SBC specialist vision. The last step is adding the servers to the console on the right Farm (and if necessary for Citrix servers in the right zone). When the server name is added you specify the MAC address of the physical hardware to this server name. From this point vPMS knows to which hardware device vPMS needs to send the jobs for the server name specified. Within the ADS tab you specify which image need to deployed to the server and if necessary you can assign partition info to the machine. If you setup the right images and partition info you can start the deployment of your server with the Operating System. Within the ICM tab you specify which Installation Script Set needs to be deployed to that server. These settings can be made per server, but also per server farm. When using vPMS the Control Center (vCC) can be used as a single point of administration for day by day tasks. When selecting the Remote Administration tab several administration options are displayed. 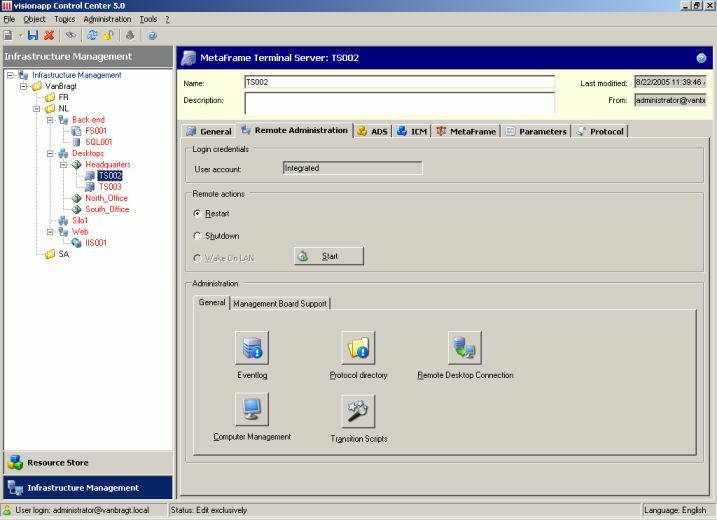 From the vCC you can easily view the Eventlog, open the Computer Management and setup a Remote Desktop Connection. Also via the Remote Administration tab the server can be restarted or shutdown remotely. If the server is included with a Remote Board (for example HP's Ilo) you can start this remote management via vCC. The actions performed by vPMS for deploying the operating system and applications and actions within the vCC are logged. Via just a view simple clicks the administrator can see the error logs for deployment and change log for changes. Within vPMS several (custom) roles can be defined where permission can be specified within the vCC. VisionApp Platform Management Suite is robust product with a good vision. Throughout the whole product you can see that a SBC specialist thought out the concept of this product. vPMS is scalable, extendible and easy to use if the product is completely configured. Like other deployment tools the initial installation and configuration is the most difficult part. VisionApp helps you with this process by supplying predefined templates, prepared Citrix installations and prepackaged common applications. It is a pity in my opinion that they used Wise for this prepackaging process, because you need to have Wise Installation Management to use these packages. Also VisionApp relays on several other additional third party products like ADS, SQL and Wise. Because vPMS is using additional third party product the IT department should also have thorough knowledge of those products (in special ADS and Wise). Also a pretty large amount of hardware is necessary if you have a big server infrastructure. Probably you will have a huge server infrastructure because then a deployment mechanism like vPMS becomes handy or necessary. If you are looking for a deployment system, have a lot of Citrix servers and there is no other deployment mechanism in place you can consider vPMS. - vPMS is Citrix "ready"